Hello all, first post here on this forum. I am from SC and glad to find a forum that seems to have some people local to the areas I may fish. Me and some buddy’s chartered a boat out of Charleston this past weekend and did a little bit of trolling and bottom fishing. I had a blast with both and limited out on Kings and snapper but the bottom fishing reminded me of how much I liked heading out on the headboats growing up. So I decided to make a point to do it more often this coming year. I have also decided to build a setup to take out as I don’t really want to use the abused combos with old line and rusty hooks they will provide. I already picked up a reel which is a Penn Fathom 40 levee drag that I plan on putting braid as backing and running the top half of the spool with 50 lb mono. This now leaves me with needing to find a good bottom fishing rod to finish out the combo. Now I know there is no one rod that does everything but I’d like a rod that will of course handle the snapper but I want something that will also have the power to lift a grouper up quickly and preferably something that has the backbone to stop a big AJ should I hook up. I do plan to fish live bait if I can get it to target the grouper and AJs. I am looking for something that is a minimum of 6ft but being on a partyboat something in the 7-8ft range may serve me better. I also need something that can handle a sinker up to 24oz when conditions call formit but will most likely fish with less. I am not looking to spend a ton on a rod if I can help it. I was looking at the ugly Stik tiger lite jigging rods and do like the price but they just seem to be a little on the short side. I prefer shorter rods for bottom fishing. I also prefer braid, but the majority of my fishing is done on a private boat with substantially lower gunnels. I love my star plasma jigging rod but its 5'2" so far shorter than what you seem to like. Look at black hole rods if you can afford them. They make some longer rods that work great for your application. we use star rods with braid very sensitive and will haul up a wheel barrow if needed. Hard to beat the Ugly Stick Tiger Lite rods for the money. I've switched to spinning reels for bottom fishing and now definitely prefer them. The Quantam Boca or Cabo are great reels for me, but there are plenty out there. I'm not sure why you would want a mono topshot for bottom fishing. I run braid all the way other than the leader. I like fishing as vertically as possible so the smaller the line diameter the better. I have come to prefer Star rods like some of the others guys have already recommended. They have a variety to choose from. I love the Paraflex they make. I also have an Ugly Stick Tiger and they are ok but heavy. You'll notice the weight after a few hours. Thanks for the input so far guys, so far the ugly Stik is what I’m leaning towards if I buy one. I am also considering building a rod which I have never done before but might be a good time to start. If so I have come across a few blanks that will fit the bill very well. On the comment of why would I want a mono topshot, from what I hear most headboats do not allow braid, I don’t know personally as I have never tried. If I were building this to go on a private boat I would use braid all the way down for the sensitivity. I will get in touch with the boats I plan to use and see if they will allow me to run 100% braid. I use a 10' section of 130# mono leader going from my braid to the 3 way swivel. Helps provide a little stretch. When grouper fishing with a locked down drag, a little stretch is helpful to reduce likelihood of pulled hooks. Most headboats don't like braid because it tangles all to hell, especially in current. Less of an issue on a private boat where people spread out more. Star Plasma and black hole rods. I know a guy who builds rods using a black hole blank. I have two of them. He is also a commercial grouper fisherman and he uses them as well. If you go with black hole go with the rod action that he uses. My black holes are a little stiff for the lighter bites. Paired with a good electric reel it makes for a great combo. Otherwise plasmas are hard to beat for an off- the shelf rod. Big braid and big mono or fluoro is the way I was shown. You can lead a horse to water but you cant make him THINK. I have used braid on the Captain Stacy. Nobody gave me any crap, and I did about as good as anybody that day. I also tangled less than my neighbors but that is unrelated to the line I used. So long as you know what you are doing, you won't have many issues with tangles on the headboat. I bottom kayak fish a lot mainly for fluke but also the occasional weakfish. For bucktail jigging use a Daiwa aird coastal baitcaster spoiled with 10# fireline on an old bass crankbait rod from bass pro. My other set up is a cheap freshwater spinning reel spoiled with 6# mono on a yard sale medium power spinning rod for slip bobber fishing. These can handle just about anything (including 3 1/2 foot brown sharks, but not cownose rays or butterfly rays). I have quality rods for striper jigging. Stradic FJ 3000 on a 7' MH tidemaster and a Stradic CI4 FA 3000 on a avid inshore MHF modified tip (LOL). And a spheros fb 4000 on a premier 7' HF2 for throwing largre topwater plugs. For deeper inshore fluke (60-100+ feet), I'm all conventional. Daiwa HD 300 XSL on a shimano teramar 7' MH and an Avet SX 5.3 on a Tsunami 7'. I forget what the rod specs are but it can handle 14 oz. I haven't fished headboats in ten years, but what I saw then was, if they allowed you to fish braid, it was with the understanding that if you got tangled, your line got cut off first. Also never saw them provide 7-8 foot rods. The shorter the rod, the greater the lifting power. Try picking up a five or ten pound weight off the floor with a seven footer, and a five footer. Thinking and weighing out my options and looking at prices, I believe I have settled on a tiger lite jigging rod. A little shorter for sure but inexpensive and every ugly stick I have owned has served me well. If I feel the need to upgrade later I will but I believe a ugly stick will be be a good place to start. Star Plasma is very hard to beat. I have a conventional with a Shimano Trinidad TN20 and a spinning with a Quantum Cabo 80. Both are spooled with 65# braid and I use about 10' of 80# mono leader. We use a Sabile knot to tie the 80# to the braid and have never had a knot failure or issue going through guides. Look in the buy sale trade forum on this site. A gentlemen is selling a brand new Star Plasma rod for a great price. His handle is jdjeffers. Great guy and a fishing partner of mine. Rod has never seen the water if I'm not mistaken. Good deal on that rod. Hey everyone, just thought I would give an update on the route I have decided to take. I purchased an ugly stik tiger lite jigging rod, which upon me getting home and mounting my penn fathom snapped in two on the very first little test tug that everyone is required to do on a new rod haha. This was not a crank down on the rod and give it all it had kind of tug. I had my buddy hold the line while I decided to put a little bend in it. Much less than would be required for a decent sized fish and it was not able to handle it. Obviously I was not impressed with the quality of the rod so I instantly took it back and got my money back. I know some will say it was probably a dud or a bad spot in the rod but I would never have any faith in a rod that couldn’t handle that so I did not want a replacement from ugly stick. I came across the Black Friday ad for Connley Fishing, which runs through the end of December and saw the Tortugas 30-60 lb rod on sale for $100. So after some emails to Connley fishing, which he was very very responsive and helpful I placed an order. I have yet to fish this rod yet but I am impressed with its initial quality, seems like a very well made rod for the price. 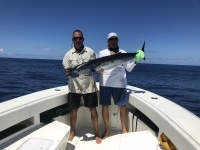 I most likely will not be making any bottom fishing trips till the end of February although I do have a wahoo/mahi trip booked in Haiti at the end of next month but I do not plan on taking this rod along. So I will let everyone know what I think about this rod when I get a chance to try it out.